Tomorrow is the BIG DAY! And we are adding to the fun with special pricing on any pre-cut fabric - Fat Quarters, Jelly Rolls, Strips, and kits are 15% off! Bring in our exclusive newsletter coupon (or show us on your phone) for EXTRA SAVINGS! 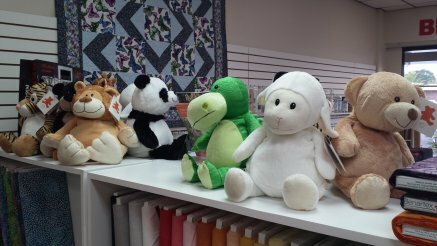 Stop by to see our new arrivals - fabric, notions, and....Embroider Buddies! 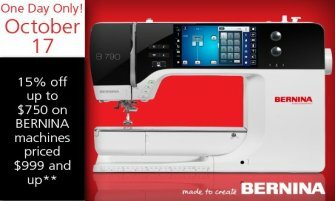 They are specially designed with a clever zipper and removable pillows so they can be custom embroidered. These cuties will be difficult - maybe impossible - to reorder this year, so claim your favorite soon! Upcoming classes are listed below. Don't forget about our FREE webinar next Tuesday, where we will see examples of different ways you can bind your quilts. clutch frame in silver or gunmetal. Early sign-up for this class is critical - you will need to start preparing! We're collecting donations for the Breast Cancer Research Foundation! 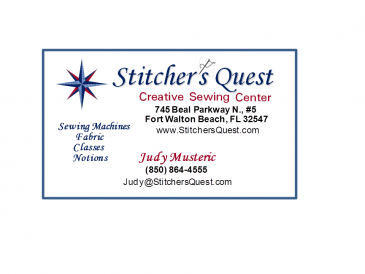 Store Hours have changed - Stitcher's Quest is now open until 6 p.m. on Tuesdays and until 4 p.m. on Saturdays. 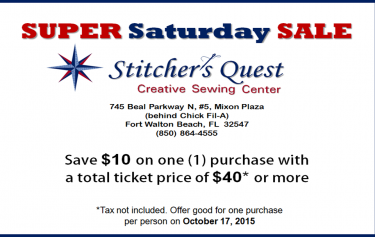 October Specials - There is still time to take advantage of these great deals!